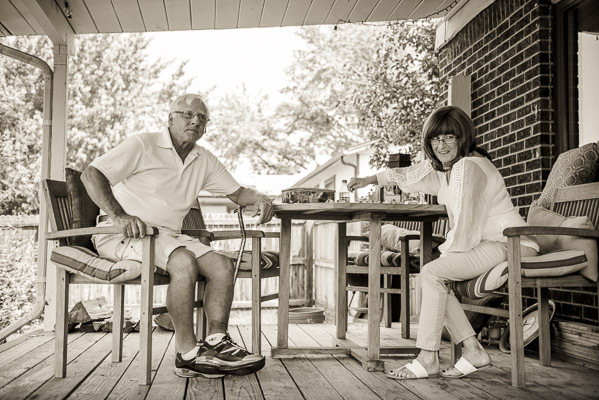 I was very grateful that Jessica, one of my longest-term lifestyle clients, agreed to try a session of documentary family photography in Denver this summer. One of the biggest challenges I'm facing with transitioning my business into a more documentary style is that my existing clients aren't sure they want to go with me. Day in the Life photography is relatively new, largely unknown to the general public, and while I get a lot of excitement about the concept, when it comes to committing to a session, it's difficult for them to walk away from more traditional photos. One thing Jessica and I agreed upon was that we would take time to shoot a very short session of traditional posed where kids get dressed up and they get something more typical for their Christmas cards. I think that makes it an easier decision for her and I plan to offer that to all my clients. I still feel strongly about my posed lifestyle photography but I am moving toward documentary work because it feels so much more emotional to me. 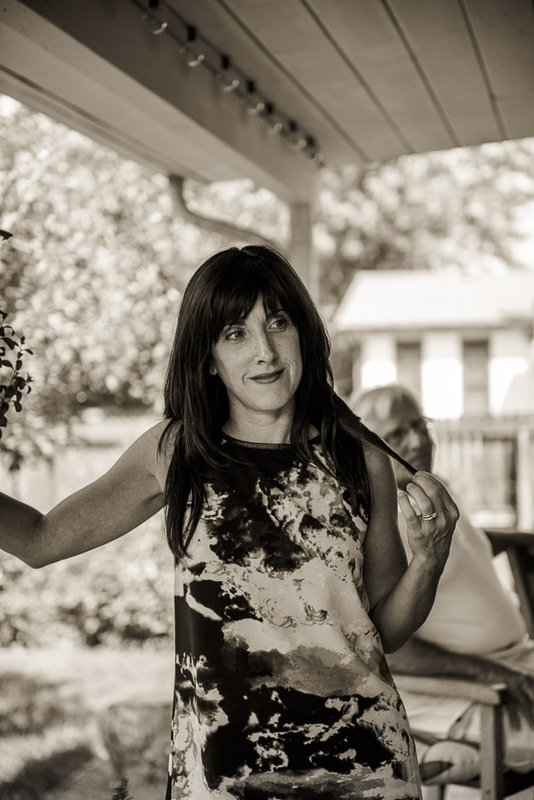 I want my clients to be deeply moved when they see their photos, I want them to see sides of themselves, their partners, parents, or children that they don't see all the time. Documentary family photos are a window into life today that a cute posed photo by a Christmas tree in September will never give you. A funny side note to this session: the cat doesn't belong to them. Both kids, separately, told me the cat was theirs and so I took a number of photographs of him. Later when I asked mom and dad when they got a cat they said "Cat? What cat?" Evidently the cat, Pickles, has been hanging around their house a lot since these photos were taken, so he's included as an honorary family member. 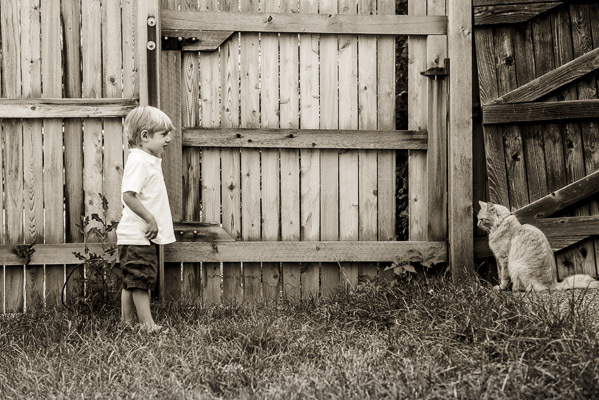 Toddler boy facing off with cat about four feet away. Silhouette of kids running out the front door. Family hanging out on the back porch. Over the shoulder photo man playing guitar while family gathers in teh background. 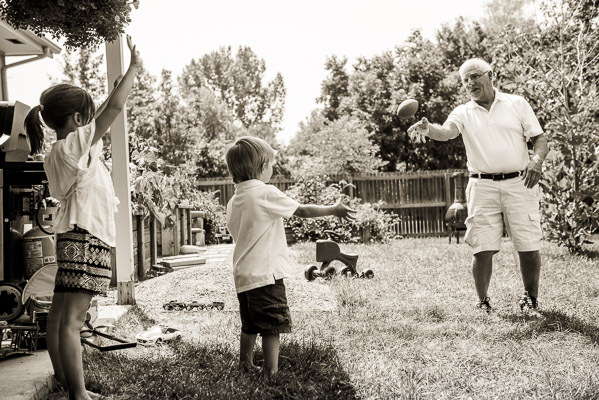 Grandpa throws football to little boy and girl. Profile of handsome man playing guitar. Closeup of little boy on plastic horse drinking a juice box. Little girl wiggles a loose tooth. Little boy licking his mom's chin. 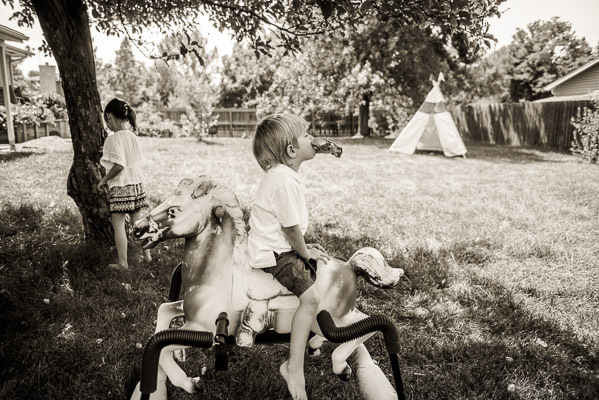 Kids playing in the yard with a plastic horse on springs and a teepee in the background. Woman hanging out on her porch. Little boy holds a football in a doorway. Grandparents at a picnic table. Boy and girl playing under a tent. Four up photo of girl dancing in her living room. I was treated to a fabulous dance performance to the painfully cute French version of The Gummy Bear Song. I'm anxious to know how John, Jessica, Janine and Jim feel about these photos. I'm interested to know what you think, too. 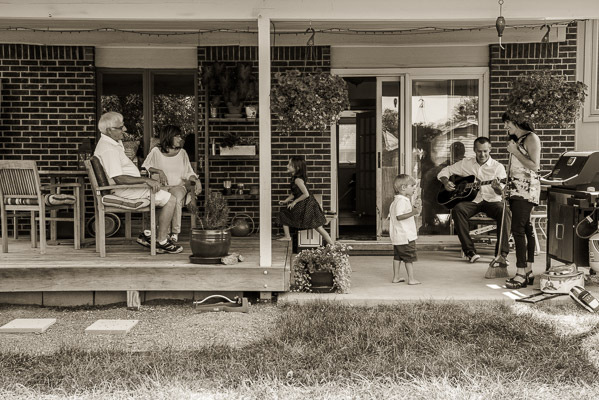 Ready to schedule a Documentary Family Photography session? Contact me!